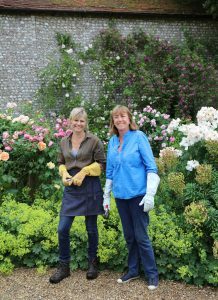 An enthusiastic gardener and plant person, Sarah works alongside her garden helper Caroline Birch one day a week to maintain the storybook walled garden at her West Sussex England country estate. The south facing walls are made of flint, the local stone in her region, rising 12’ in height and 2’ in thickness. The roses are attached to the wall with wires. 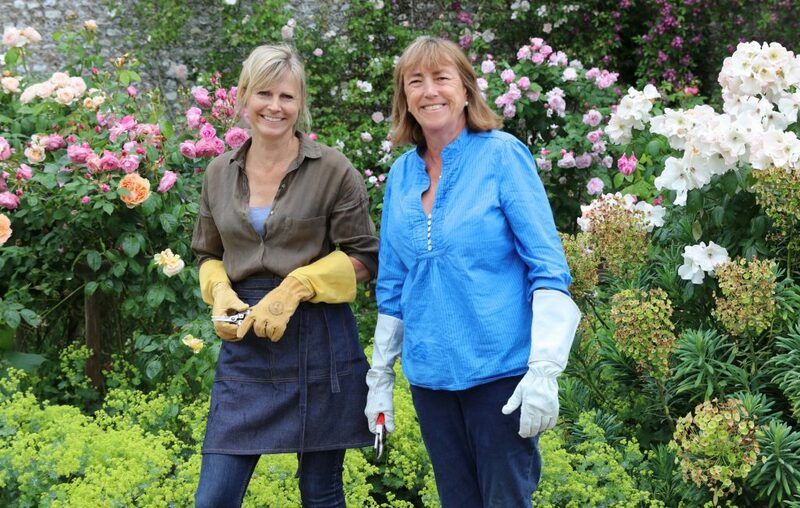 Sarah Green (right) with her garden helper Caroline Birch in the walled garden, wearing Womanswork leather rose gauntlet gloves. 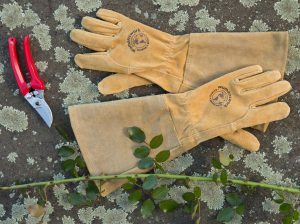 Sarah’s rose maintenance program is simple, because “my roses don’t require a lot of care,” says Sarah. The only pruning she does is to top them off and tidy them. In autumn she mulches them with cow manure from the farm (after the manure has been seasoned for a couple of years). 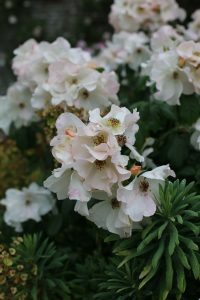 In early spring she uses a fungal spray, but if the odd black spot shows up she lets it go, saying “that’s life.” An irrigation system is used very sparingly because “the plants come to depend on it,” says Sarah. 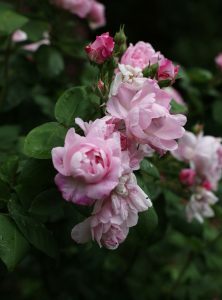 She grows as many as 30 varieties of roses, including David Austin old rose hybrids, New English climbers, some standards and a few floribundas. As cut flowers for bouquets her roses provide abundant pleasure inside her home. 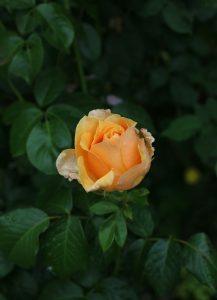 Sarah estimates that her roses comprise just 10% of her whole garden. The main walled garden, which measures 160 feet, has a deep herbaceous border with not only roses but phlox, hollyhocks, salvia (‘Amistad’—the tall variety), ammi majus (because the umbrels add a soft touch under the roses), lavender and more. After the main border is finished, hydrangeas take over, including ‘Annabelle’ arborescens, ‘Madame Emile Mouillere’ and paniculatas. Dahlias bloom late in the summer. 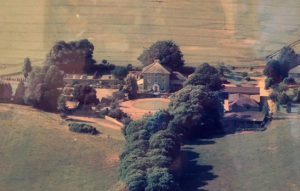 The house, built around 1790, is surrounded by 2 acres within walls, and 1,000 acres of farm outside of that. Part of the farm is leased to a vineyard that produces award winning English sparkling wine. “The ground here is exactly the same as in Epernay, France where they grow Champagne,” says Sarah. Wheat and barley also grow on the farm, and sheep graze at the edges of the acreage. The drive to the house is a mile long, with sweet chestnut trees lining it on either side. A fulltime gardener, or groundskeeper, spends 2 ½ days each week mowing grass in the summer. When Sarah and Richard moved into the house the gardens were overgrown and the house needed work since it had not been touched since the 1940’s. 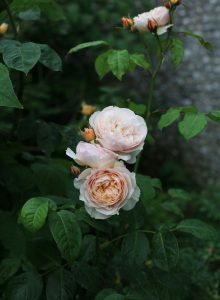 Sarah grew up with a cottage garden full of roses, tended mostly by her father, but has had no formal training in gardening. 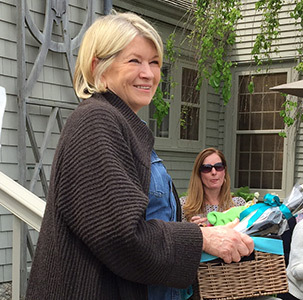 She gives credit to an American woman named Derry Watkins, who has a garden and nursery near Bath called Special Plants, for helping further her education about and passion for plants. 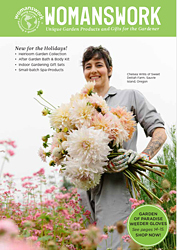 Derry collects unusual plants from all over the world and has a garden stand at an annual garden show, at which Sarah lends a hand and learns more about what’s new. The annual Chelsea Flower Show in London, a couple of hours by train from Sarah’s home, is another source for information about new plants. Sarah does her own propagating with seeds and cuttings in her cold frame and greenhouses. She has a west facing conservatory for overwintering tender plants. Typically in her region the temperatures do not drop below 28 degrees Fahrenheit. 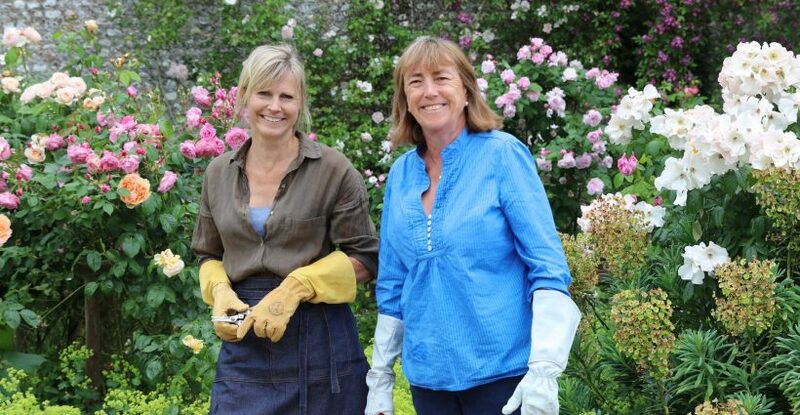 After raising children Caroline Birch, Sarah’s helper one day a week, was trained in horticulture through a British program designed for individuals returning to work or changing careers. 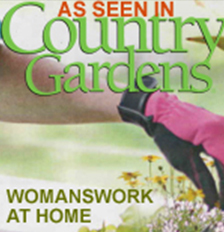 The program, “Work and Retrain as a Gardener” (WRAGS), matches a trainee with a working garden. The trainee works alongside the expert owner or head gardener 14 hours a week for 12 months, receiving the National Living Wage from the garden owner. 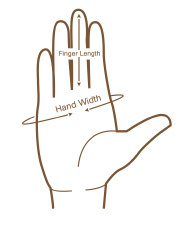 After completion the training she (or he) receives will help them to get a job in horticulture. All photos in this story were taken by Jessica Meyrick in the UK.